July 7, 2010 Clifton & Pequannock, NJ – This past June there were several Relay for Life Charity Events going on in the State of New Jersey. Two of the Relay for Life events took place close to the Fox Institute Clifton, NJ campus. 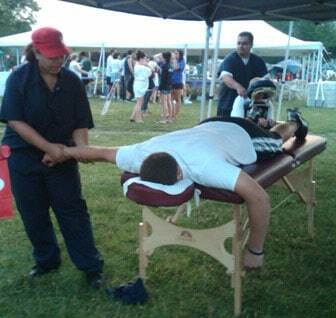 The Fox Institute team, with some great leadership from many members of the staff and faculty, rounded up several massage therapy students to donate their time and massage skills to two of the Relay for Life events. Some of the students helped relax participants before the event with pre-race sports massages and helped them recover after their participation in the event with post-race sports massages, and others actually walked in the event. The students volunteered at the Relay for Life in Clifton and the Relay for Life in Pequannock. Relay for Life is a volunteer-driven cancer fundraising event of the American Cancer Society. Relay for Life events are typically held in local communities like the ones the Fox Institute student’s participated in. The events usually take place during a 24 hour period and several participants stay overnight at the facility. Although the main objective of Relay for Life is to raise money for cancer research and cancer patients, the event is held to spread cancer awareness, celebrate the lives of survivors, remember those who lost their lives to cancer, and unite a community in the fight against cancer. The Fox Institute students helped to achieve these goals on June 12, 2010 in Clifton. The event was hosted at the Clifton Stadium where 392 participants (which included 46 relay teams) and the event raised over $71,000.00. Team Fox Troopers from Fox Institute not only donated their time as masseuses to the participants but also collected over $1,000 in donations from other students at the School. Just one week later in Pequannock, NJ on June 19, 2010 the Pequannock High School held a Relay for Life event. Several massage therapy students from Fox Institute gathered from 5pm until 8pm offering the 313 participants (including 36 relay teams) a 3 hour period of sports massages. The Relay for Life event not only offered the students with onsite experience but they also can be proud that they participated in an event that raised over $55,000.00.